The Doctrine of the Hert was the fifteenth-century English translation of De doctrina cordis, the thirteenth-century Latin devotional treatise addressed to nuns. The text progressively pairs the seven gifts of the Holy Spirit with seven key actions of the heart, leading readers toward contemplative unity with God. The text was a religious bestseller. It circulated widely throughout Europe between the thirteenth and fifteenth centuries and was translated into numerous vernacular versions. This book consists of ten essays from an international group of scholars of medieval religion discussing the Middle English text alongside its Latin forebear, and other European vernacular translations (French, German, Spanish and Middle Dutch). Despite its medieval popularity, The Doctrine of the Hert has largely escaped the attention of scholars until recently. Yet it has much to offer regarding our understanding of late medieval female spirituality. University of Exeter Press’s new edition (published June 2009) opens up the field by providing access to the text, and this companion further establishes scholarship on this text. Denis Renevey is Professor of Old and Medieval English Literature and Language at the University of Lausanne, Switzerland. He has published widely in the field of vernacular theology and female religious writings. Christiania Whitehead is a Senior Lecturer in Medieval English Literature at the University of Warwick. Her fields of interest lie in medieval allegory and female spirituality. These volumes ['The Doctrine of the Hert: A Critical Edition with Introduction and Commentary' and 'A Companion to the Doctrine of the Hert'] represent a very significant and welcome contribution to medieval scholarship and will undoubtedly influence much future work on vernacular religious writings. An unusually coherent collection of essays. This is an outstanding collection. These insightful and rigorous essays, accompanying the new critical edition of 'The Doctrine of the Hert', will restore attention to an important family of devotional works. The Companion combines a valuable introduction to this largely neglected group of texts with a particular focus on the Middle English Doctrine. The authors are in productive conversation with each other, and the volume is clearly introduced and nicely cross-referenced. 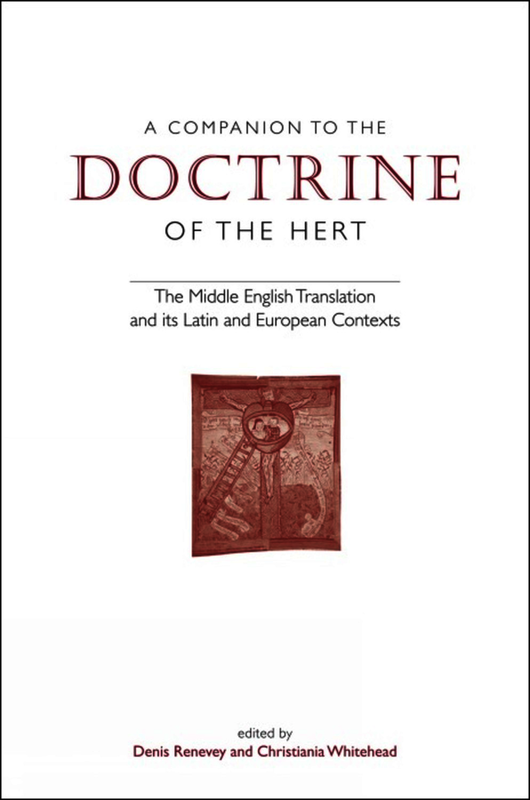 This book is a careful and ambitious attempt to cover the whole gamut of Latin and vernacular traditions of the Doctrine of the Hert, and deserves considerable credit as a pioneering work in its field which also manages to be a compendium of everything one needs to know about this text. Denis Renevey is Chair of Medieval English Literature and Language at the University of Lausanne, Switzerland. He has published widely in the field of vernacular theology and female religious writings. Christiania Whitehead is a Senior Lecturer in Medieval English Literature at the University of Warwick. Her fields of interest lie in medieval allegory and female spirituality.